Your Health Matters: Give the gift of life this holiday season. When was the last time you saved three lives in a just over an hour? Would it interest you to know you can save three lives every eight weeks? In one year, you can save 18 lives. All it takes is a blood donation. According to The American Red Cross, each whole blood donation can help up to three people. Consider sharing the holiday warmth this season by giving the gift of life. It is true that not everyone can donate blood. You have to be healthy (i.e. not feeling sick and able to perform the duties of your day as normal), be at least 17 years old, and weigh at least 110 lb., among other things. You can check the restrictions here. If you’re eligible to donate, but a little nervous – maybe you’ve heard that it hurts, or that it’s a huge needle – there are a few tricks you can try. The first is just to think about the reward being greater than the risk: you may get a pinch of a needle, but three people’s lives may be saved. You could also try bringing along a friend for moral support, or a book or music to distract you from the actual donation. For me, the worst part is waiting to be stuck, so it really helps me to have someone there to talk with. Also, don’t be afraid to tell the staff that you’re a little nervous – they’ll do their best to make you as comfortable as possible. I also suggest making an appointment. You’ll be more likely to go if a little reminder pops up on your phone. Plus, by scheduling an appointment, you can minimize your waiting time. In fact, you can register for our blood drive, which is being held on January 3rd at 10:00 am in Robinwood Suite 142 by clicking here. 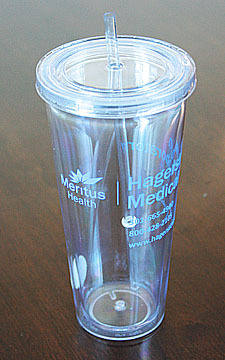 Plus, if you donate at that blood drive, you’ll get this awesome Hagerstown Medical Lab tumbler!